There are currently 200 blocks of cotija cheese stacked and ripening in the sun at the United States border with Mexico. They’re the work of L.A.-based, Canadian-born artist Cosimo Cavallaro, who hopes to construct a 1,000-foot long, 6-foot-high cheese wall as a critique of the Trump-supported federal border wall. The wall—which would “Make America Grate Again”—is part-art project, part-political statement. Cavallaro is fundraising for this effort via GoFundMe, where he notes each solid block of cheese costs $100. If that seems wasteful, that’s the point, Cavallaro tells McClatchy news service: “You can see the waste in this [cheese] wall, but you can’t see the waste in a $10 billion wall?” He does note on his website—cheesewall.com—that all the cheese blocks used for the wall are expired and not suitable for humans to eat. 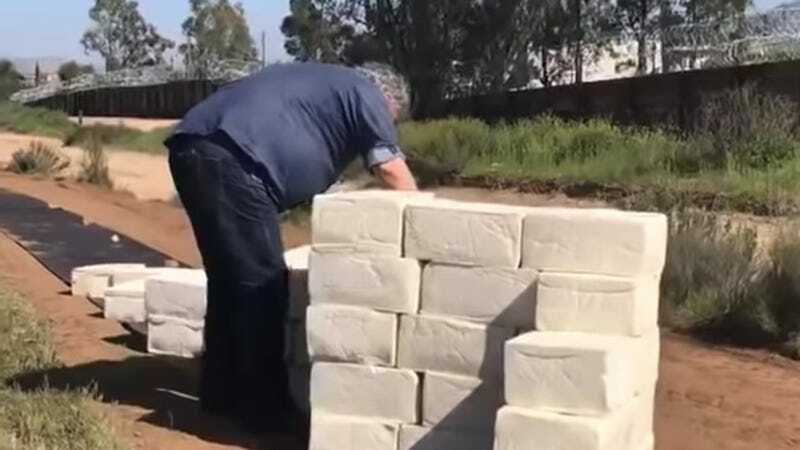 His goal is to raise $300,000, which would allow him to create the 1,000-foot-long wall; in addition to soliciting crowd-funded donations, he is also selling cheese-related merchandise to fund the project. So far, he is only $1,180 of the way there. Only tangentially related but: Does anyone actually grate cotija? I usually crumble it.